Today, new business models in the marketplace coexist with traditional ones and their well-established IT architectures. They generate new business needs and new IT requirements that can only be satisfied by new service models and new technological approaches. These changes are reshaping traditional IT concepts. Cloud in its three main variants (Public, Hybrid, and Private) represents the major and most viable answer to those IT requirements, and software-defined infrastructure (SDI) is its major technological enabler. IBM® technology, with its rich and complete set of storage hardware and software products, supports SDI both in an open standard framework and in other vendors' environments. IBM services are able to deliver solutions to the customers with their extensive knowledge of the topic and the experiences gained in partnership with clients. 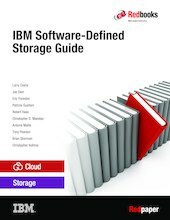 This IBM Redpaper™ publication focuses on software-defined storage (SDS) and IBM Storage Systems product offerings for software-defined environments (SDEs). It also provides use case examples across various industries that cover different client needs, proposed solutions, and results. This paper can help you to understand current organizational capabilities and challenges, and to identify specific business objectives to be achieved by implementing an SDS solution in your enterprise.